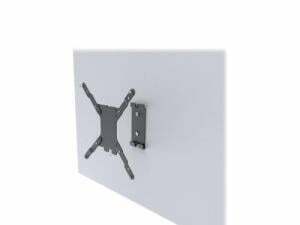 This Vision Flat-Panel Mount is robust and simple. It fits any flat-panel LCD or LED screen which uses a standard VESA mounting configuration up to VESA 200"- which are 200 x 200mm tall apart. SWL 30 kg Most desktop monitors are very lightweight, but interactive displays and kiosk touch-panels are much heavier. Vision's VFM-W2x2 can take up t0 30 kg - sufficient to support most monitors up to 50?. A proven 2-part design allows fast fixing, with slotted holes on the wall part allowing levelling adjustment after fixing. Secure Once in place a locking screw is fitted to avoid theft.